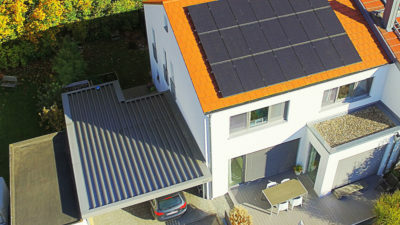 A growing number of homeowners in Germany are installing batteries to store solar power. As prices for energy storage systems drop, they are adopting a green vision: a solar panel on every roof, an EV in every garage, and a battery in every basement. Stefan Paris is a 55-year-old radiologist living in Berlin’s outer suburbs. He, his partner, and their three-year-old daughter share a snug, two-story house with a pool. The Parises, who are expecting a second child, are neither wealthy nor environmental firebrands. Yet the couple opted to spend $36,000 for a home solar system consisting of 26 solar panels, freshly installed on the roof this month, and a smart battery — about the size of a small refrigerator — parked in the cellar. On sunny days, the photovoltaic panels supply all of the Paris household’s electricity needs and charge their hybrid car’s electric battery, too. Once these basics are covered, the rooftop-generated power feeds into the stationary battery until it’s full — primed for nighttime energy demand and cloudy days. Then, when the battery is topped off, the unit’s digital control system automatically redirects any excess energy into Berlin’s power grid, for which the Parises will be compensated by the local grid operator. Insufficient battery technology is the greatest impediment to a clean energy present and future. Despite what the Green New Deal says or Tesla claims, we cannot transform our electricity generation until we see a revolution in battery technology. We cannot end carbon emissions from power plants until we find a way to efficiently and safely store large amounts of power. We need to master the ability to quickly charge batteries without destroying their lifespans before electric vehicles take over. To truly make a difference, we need to make the creation and disposal of batteries less harmful to the environment and less reliant on mining in countries with exploitative labor practices. We need to find a way to store massive amounts of solar and wind power to be distributed upon demand to make renewable energies viable as baseload producers on the grid. Just a few days after Tesla (NASDAQ:TSLA) posted its second consecutive profitable quarter, the company has stated that it plans to acquire energy technology firm Maxwell Technologies, a California-based maker of ultracapacitors and batteries. Maxwell Technologies specializes in the development of ultracapacitors. Prior to its acquisition by Tesla, Maxwell had been working on developing dry electrode technologies that could be utilized to create ultracapacitors that can store large amounts of electrical charge without losing energy — a breakthrough for electric cars and energy storage devices. Ultracapacitors are lauded by several industry watchers as a possible alternative to today’s batteries, considering their potential to be safer and more reliable technologies.